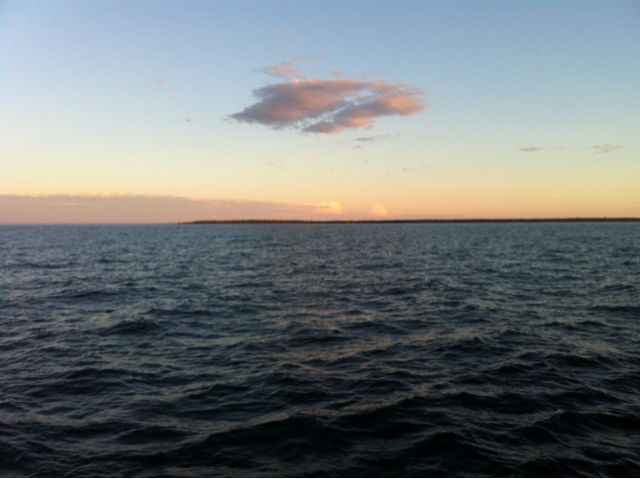 This has been the longest sail of the summer - 9 days at sea! It's really nice as you get into the rhythm of sea watches and everybody, ship included, is happier at sea then in port. 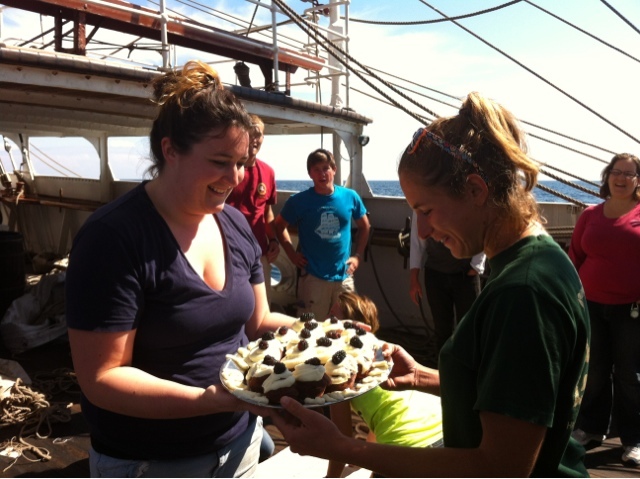 For many of the volunteer crew this is the last part of their summer's journey so it's a little bittersweet as we count off last night watches and last days at sea. We started our sail with a Great Lakes Challenge race. It was about 300 miles long and took us a few days to finish. We crossed both the start line and finish line within the allowed time - a first since I've been back on board! The finish line was reached around 11 pm. and I (along with many others) was woken up at 10:30 to be ready to take in sail. Finish line crossed. Sails doused. 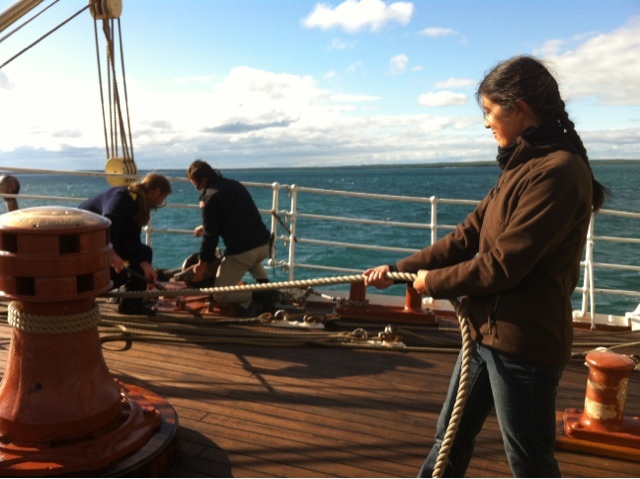 Then up we went in the rigging to furl everything. It was done in a very orderly way, no rushing, lots of care taken and warnings that this was not the time to be falling overboard. I was up on the royal (topmost sail) again and was sure glad I'd been up during daylight so I had an idea of where to find footholds. There were a few crew birthdays to be celebrated during this leg. On board birthday celebrations usually include cake and ice cream and a lot of people singing. Rather like birthdays on land. 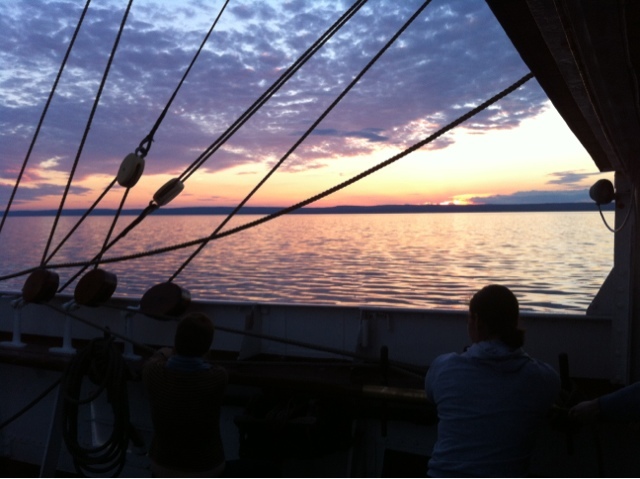 During our sail our engineer instituted evening quiet times. About an hour without engine or generator noise. They were lovely! 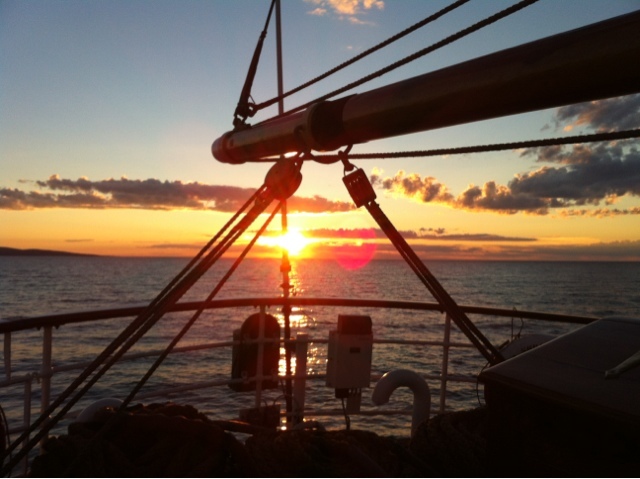 Sailing along as the sun set listening to the wind and the waves. Unfortunately we can't do this often as the motor is often running and the generator powers our navigational equipment. There was one day of heavy fog. 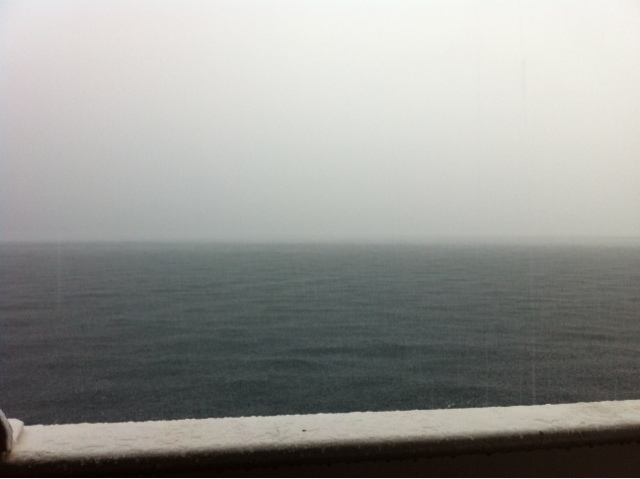 For over 12 hours our fog horn was going. One long, two short blasts every two minutes. I had that responsibility for a while and got very good at having conversations in two minute chunks! I'm continuing to learn so much! This week we had a rip in a sail so down it came and up went a replacement sail. (Very easy to find in our newly organised, that was an all day project, sail locker.) I went aloft to help "bend on" the new sail. It was a fun experience and one that doesn't come around too often. One of the girls who sailed on this ship for 8 months with Class Afloat hadn't done that before! Another new skillI got to try was tailing the line on the winch. Not a very hard job but one that comes with responsibility as if you mess it up it can be a bit dangerous. In this case we were using the winch to haul our anchor into a new position so you don't want unexpected slack in the line holding the anchor! We anchored a few times so we'd be on time for going through locks and arriving in Chicago. Days at anchor are great for cleaning and organising! It also means we don't stand sea watches and by some luck of the schedule I got a night with 10 hours in bed! It was great to get a good rest this far into the journey. We ended the sail with a talent show that was alternately entertaining, hilarious and touching. 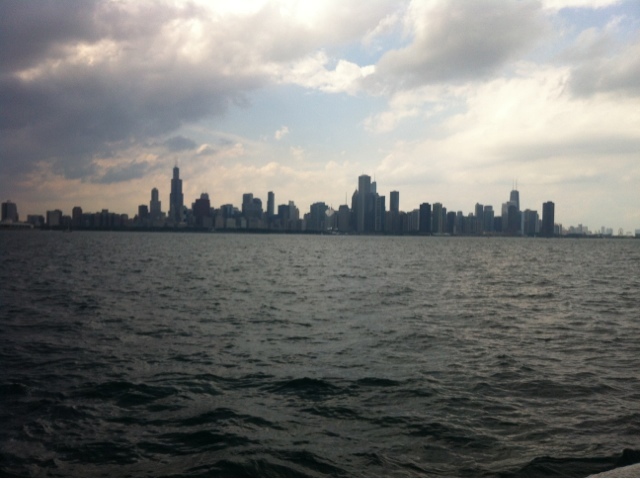 The next day we sailed into Chicago where 44 hours of deck tours must pass before we can sail again.